We didn’t plan on being broke. It just kind of happened. At the height of the recession, we could barely make ends meet, and Christmas was coming. 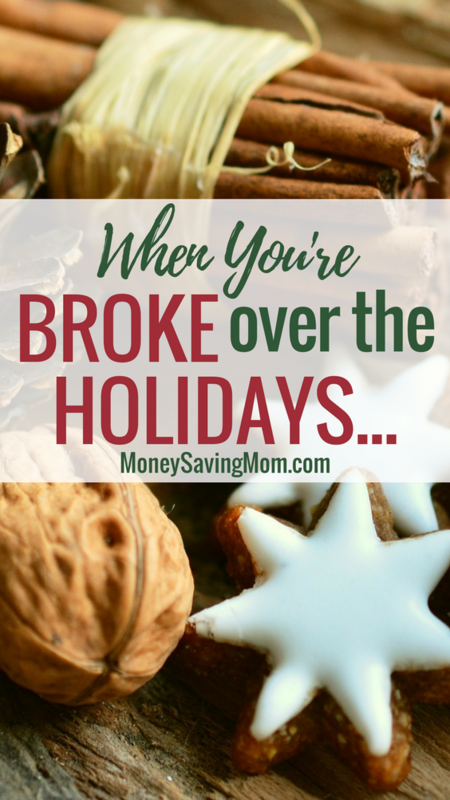 The holidays had always been full of planning and traveling, gift exchanges and shopping… until we had no money. The internet is loaded with ideas about finding contentment in the season, or how to nurture joy in a more simple holiday. But what do you do when you have no money during the biggest gift exchange in the world? For several years, my husband and I didn’t exchange presents. Our gift to each other was traveling to see family. We also cut out nearly everyone we weren’t going to see on Christmas Day – this included cousins, distant aunts, and basically anyone we had to pay shipping for. Instead, we sent a few cards, printed some photos for grandparents, and baked cookies for co-workers. If you’re like us, you love to give gifts. Honoring special people in your life at this time of year is fun and meaningful. You want to share the joy of the season with your nephews, nieces, church friends, and the librarian. But this year, who is the most important? Who can you save for another year? Right now, in order to take care of your family, what needs to be released? Eventually, you can add them back to the list. But you will never regret providing for your family first. When I first suggested a name drawing, I had several siblings still living with my parents. They were reluctant to agree, because they had the excess cash that comes with not paying bills. However, once they moved out, they thought drawing names was a great idea! Rather than feeling obligated to give gifts to everyone in your family, suggest a family name drawing or Secret Santa. That way you only have to purchase one gift, but everyone can enjoy a gift exchange together. Homemade seasonings are my favorite. They cost pennies, they’re something most people don’t have time to make themselves, and a cute ribbon and label adds a finishing touch. Even if you aren’t crafty, you can make a few easy homemade gifts that communicate love and attention to people you can about. If you like to bake, try a loaf of or . Even if you don’t like to bake, these foolproof recipes only take 10 minutes to get into the oven, and they turn out great. Gift giving is fun. It can be really meaningful. It can also feel stressful and distract you from the true meaning of the season. Rather than kicking yourself for having a rough year, congratulate yourself for being intentional with your priorities, for choosing NOT to go into debt, and for working hard to take care of your family. This season is about joy, peace, family, and unconditional love. None of those ever came wrapped in a box, and you can share those gifts with everyone, no matter what your budget looks like. Get Steph’s Dirt Cheap Holiday Gift Guide at , where she teaches you how to save money and eat healthy. Her Free 4-Week Menu Plan shows you how to spend less than HALF the average grocery budget on real, whole foods. « $2 Crest Coupon = FREE toothpaste at Walgreens and Kroger! I love to stock up on the free-after-rebate deals available on Black Friday. CVS and Rite Aid had tons of items and Macy’s had 10 items as well. This is a great way to pick up gifts that otherwise might not be affordable. I am making 5 gift baskets for Hanukkah I know will be enjoyed. Do a gift box full of freebies and samples, shop at a dollar store. That’s a great idea! I did a few of those. Dollar store is awesome. This was a meaningful post to add. Thanks for helping to bring down anxiety. With a job loss and unexpected expenses taking the extra funds I was getting stressed. I appreciate these words. Hi Jen, I’m sorry you’re going through this. It’s hard no matter the season, but it feels especially painful during the holidays. There will be more years with more money – this year can still be fun and special in a lot of meaningful ways. Those ultra-tight years are some of our best memories now. Hang in there! I’m planning on giving my nephew craft day “tickets” where he can ask for me to come do a project with him. The time spent together will be an extra bonus. Other family members are getting cupcakes in a cup (my cheap twist on cupcakes in a jar) or banana bread mini loaves.